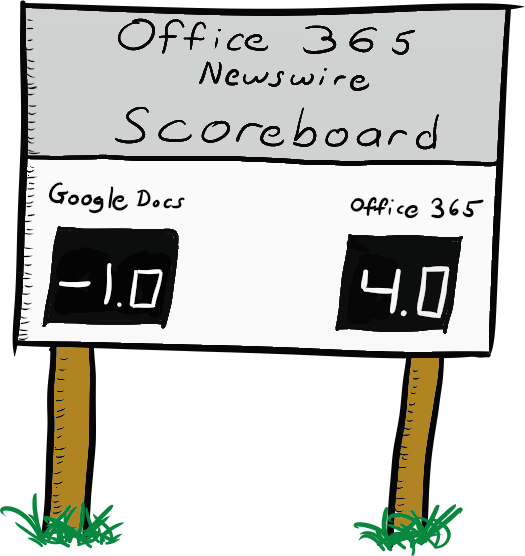 Office 365 News: Can Google Apps unseat Microsoft Office and Exchange? Posted on Friday, May 18th, 2012 at 11:00 am by Ty Anderson. Facebook goes public today. My instincts say Facebook stock is worth considering. My instincts thought the same regarding MSFT 10 years ago. I acted on that one & bought some stock. Ten years later, I am just now seeing the stock price is above my purchase price. I think Facebook will continue to do well. Their user base is too large for advertisers to ignore. What will be interesting to see is how Zuckerberg and Facebook adjust to the pressures of Wall Street. How will Facebook change now that pressure to make a profit… NOW… for their shareholders… is upon them? With that aside, let’s move back to our regularly scheduled content. Office 365 hard enough to penetrate US government :: More :: 1 Point for Office 365. Aussie non-profits adopt Office 365 en-masse :: 1 Point for Office 365. Note AB switches from google docs to Office 365 :: 1 Point for Office 365. Believe it or not, I went looking for news favorable to Google Apps. This week is what you call a "slaughter". I could have included more items and really run up the score but this is enough. I also resisted the urge to keep score with items that follow. 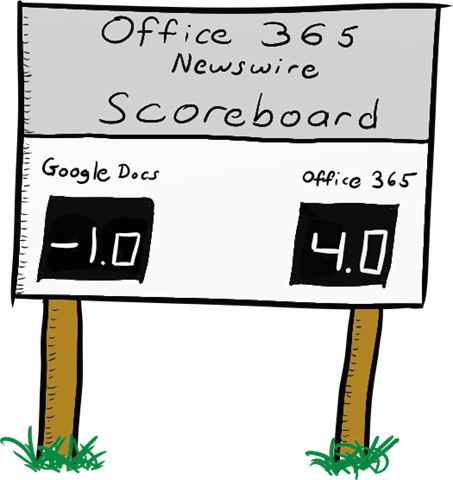 Office 365 news & editorials! :: You got questions? We got answers! Is Office, Exchange lock-in Microsoft’s best weapon in the Cloud? :: I think the answer to this questions is "Yes". Gmail freaks out the less technical among us. That said, features matter. Free is one thing. Useful is another. And, yes, I now, Google Apps for Business is not free. Can Google Apps unseat Microsoft Office and Exchange? :: My opinion? No. Google Apps is to Office 365 as Windows Phone 7 is to iPhone. The Office 365 approach to privacy in the public cloud :: Privacy is a big deal. Judging by the success of Facebook and Gmail, we (the general "we") don’t care much about privacy at the individual level. But companies care greatly. It is one of the first questions raised by executives I speak to about the cloud. How secure is my data? Who owns? What risks do I expose my company to? Etc… This article is straight from Microsoft and provides links to additional Office 365 Privacy-related content. Google Apps v. Office 365: Email and messaging :: A very detailed analysis complete with an Excel spreadsheet. The fact that is not made available via Google Docs is not lost on me. Office 365 plan for pain :: One man’s tale of the pain caused by Office 365’s Plan P. As he puts it, "P=Pain". He makes a great point about how MSFT muddles the details that differentiate between the plans. All I can say is that he should read the Office 365 Newswire b/c I scour the Interweb to find items that fill gaps like this. I’ll make it easier… just go with the Enterprise plan. Business Cards and Office 365? :: Learn how to make digital biz cards and effectively use them. Four tips to create memorable complex passwords in Office 365 :: I have a great tip on this one but I am not sharing here. I’ll save it for the next time we share a beer together. But you’ll need to remind me as I’ll forget between now and then. Saving files to Office365 Teamsite directly from Word 2010 :: Are you using a SharePoint Online team site? Do you want save directly to one of its document librarys within Word? Yes and Yes? Then this tip is for you! Bonus: this tip works for SharePoint on-premise as well. .NET 4.5 improvements for cloud and server applications :: The MSFT DevDiv leader, S. Somasegar, has the details. I don’t know if you noticed but the cloud is kinda important. SharePoint 2010 PowerShell GUI tool :: What happens when you slap a GUI to command-shell tool? Normal people start to use the technology and IT Admins brag about how "I can do that and more using the command shell". Office 365 helper scripts :: A bone for my IT Admins friend. Despite all the harrassment… deep down… I love you guys (and gals). This scripts are intended for use during Office 365 deployments. NIH Study: Coffee really does make you live longer, after all :: I knew it! All you people that think coffee is bad for you are just plain wrong!